Continuity mistake: When Kirsty accidentally opens the box while in the hospital, the face with the large diamond design on it is initially on top, then when it cuts to a close up, the box somehow flips 90 degrees so the face with the circle on it is on top. Continuity mistake: Throughout most of the film, Larry has a bandage on his right hand. When he talks to Julia through the bathroom door, Larry's bandage is on his left hand. Revealing mistake: When Frank is trying to stab that girl, his switchblade is obviously fake because there is a line on it that the dagger will go into when he hits her with it. 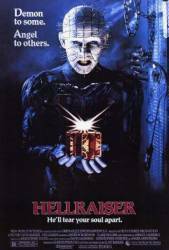 Pinhead was not named in this movie, and is credited as lead Cenobite.